So in an effort to eat healthier I have been trying to have more salads at dinner. This is actually working really well for me. I have a carb filled lunch, such as sketti and meatballs, and dessert at lunch and then I have salad at dinner. It seems like eating my carbs earlier in the day is working as I burn them off by bedtime and I still get to have the carbs I love and the sweets. I have lost almost 7 pounds so it has to be working right? Anyhow I was getting tired of the same salad so I found a new recipe in my awesome Sunset magazine (thanks to my MIL for introducing me to this really cool magazine). It was called Salmon Cakes with Greens. I could not find it online so I will type it here. Think crab cakes but fish instead of shellfish and all sorts of yummy ingredients. The recipe also has you make your own simple dressing and I have never made my own dressing like this and I was pleased with the results. Combine mayo, 1 Tb shallots, 1 tsp mustard, the buttermilk and lemon juice in a bowl with whisk, set aside. Combine salmon, egg whites, remaining 1/4 c shallots, capers, breadcrumbs, remaining 1 tsp dijon mustard, salt and pepper in another bowl and mix well, shape into eight 3-inch round patties. Heat oil in large non-stick skillet over medium heat. Cook salmon cakes about 6 mins on each side, till golden. 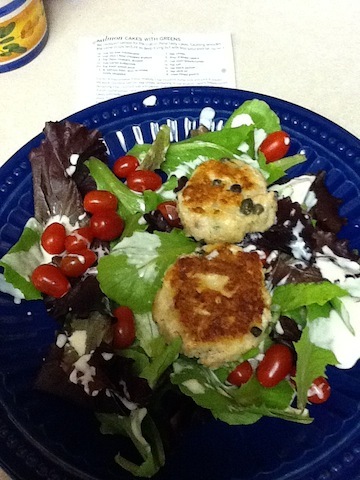 Toss greens with half of buttermilk dressing mixture and divide salad among 4 plates, top each with 2 salmon cakes. Serve with remaining dressing on the side. 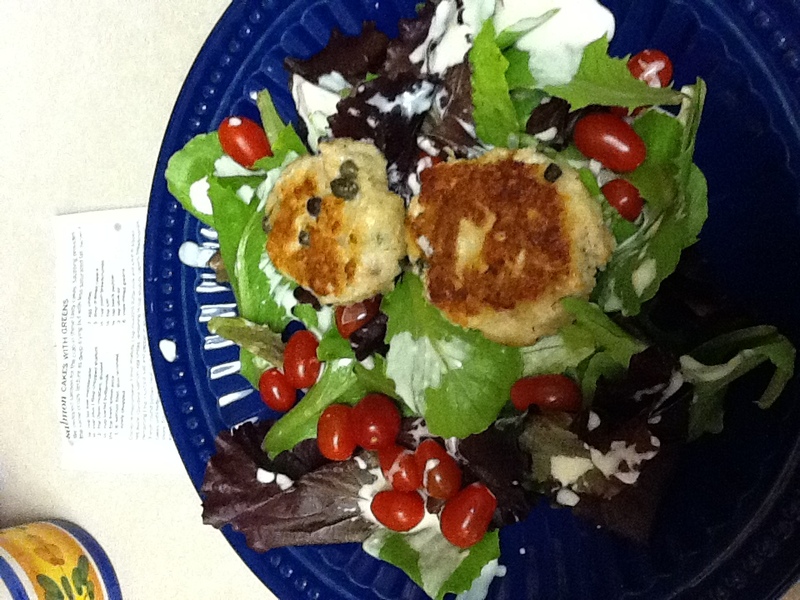 This dish only has 396 calories for 2 salmon cakes and 2 cups of the greens. I only made half a batch of the dressing since it was just me and I did not know how long I could save it, will use some the second day and then probably toss the rest and use my own dressing after that. The dressing was actually quite tasty and I have never made buttermilk dressing before, but I might have to look for some other recipes too! It was so delicious and nice to have a salmon cake instead of the usual crab cake. I think you could adapt this salmon cake to many other recipes where crab cakes are used, such as crab cake egg benedict or crab cake pasta or crab cake sliders, stick a salmon cake in those recipes instead for a fresh twist. So if you are looking for a healthy alternative to dinner that is actually quite tasty, go fish! My husband is easily influenced :). A sad looking kid came to our door last fall and talked him into a magazine subscription. I get this family magazine (totally not my cup of tea BTW, I am a gossip mag girl) and I think it comes from Disney. Anyhow I flip through it and sometimes I can find some neat crafts or recipes for me and the kids. The other night I made the Two-way Skillet Mac and Cheese and let me tell you it was amazing! My kids are cheesy noodle kids to the core, this is what they always order from the kiddie menu, with some servers getting confused at the request of “cheesy noodles” – hello, Mac and Cheese people?! I loved this idea because you make one big batch but split it into two skillets to broil and melt the cheese. Why two skillets you ask? Because the grownup skillet has way more fun in it. 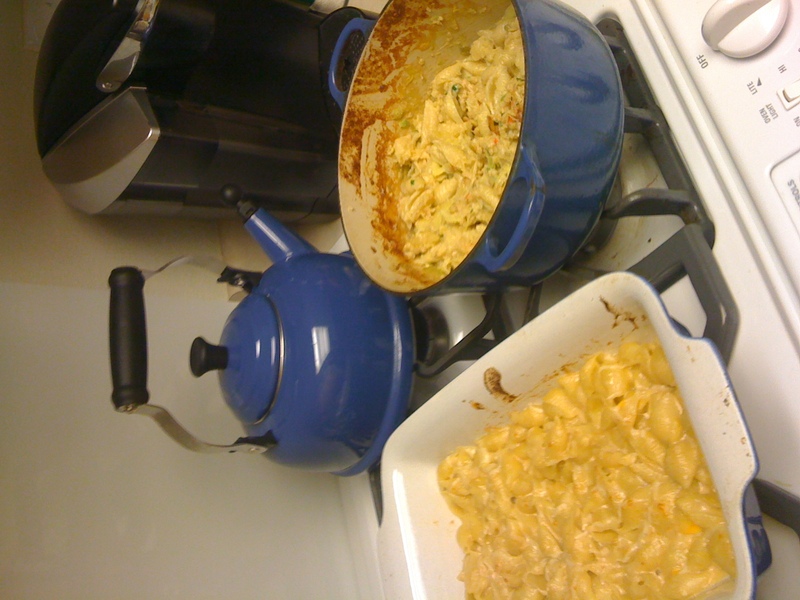 The kid version has just the cheesy noodles in it, but they are no regular cheesy noodles with 3 kinds of great cheese and other cool ingredients, they were so good! The grownup ones have the addition of green onion, green chiles, artichokes and crab meat, can you say “how you doin’ mac and cheese.” I am cheap so to buy a $8 can of crab meat was not an option so I bought a $3.99 pack of maryland lump crab cakes and baked them and broke those up into my dish. I also only made half a batch since my hubby is not here and it is just 3 of us. I recommend this dish if you want to treat yourself to something the kids will eat but the parents can really enjoy the extra kick. My kids don’t like breadcrumbs so I only put those on the adult skillet. Pop ’em in the broiler for 5 mins and you have some bubbly cheesy goodness. So if you feel like a two-way tonight, try this skillet mac! I made homemade happy meals for my kids last week, complete with decorated paper bags and little nugget holders I made out of paper I taped into pockets. I labeled everything “McMomalds” and the kids got a big kick out of it. Best thing was that my happy meals were healthy because I made my nuggets and chocolate milk myself so I knew what was in them. To stick with the theme I made “Momino’s Pizza the next night. At Momino’s we ordered yummy pizza and also cinna-stix. I used my favorite pizza dough recipe and I realized I have not shared it with my readers. My Now or Later Pizza is yet another recipe from King Arthur Flour. This is one I have been using for years, thanks to my mom who introduced me to it. It is a simple recipe and if you can find the Semolina flour you will notice a big difference in the texture and taste of the dough, it is almost like NY Pizza style. I often make it without the Semolina too and it comes out just fine. I make it in my bread machine and it is so easy to do. I have bought King Arthur’s dough enhancer before and it is good, but usually I just skip that ingredient. 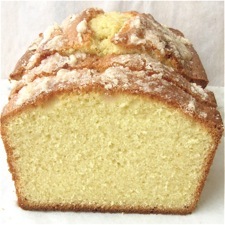 I love Pound cake. I am not sure why it is called that, does it weigh a pound perhaps? No I am sure it is called that because it adds a pound to my already delicate frame (haha, yeah me delicate? yeah right). Seriously the last time I made a pound cake it makes the two loaves and I polished them both off. One pound went to each cheek… but as usual I digress. I posted my caramel pound cake recipe on here before and I have another great pound cake recipe, chocolate cream cheese poundcake, which I need to post for my fans. But today I am posting one from King Arthur Flour. If you haven’t checked out their site please do and you will be drooling in minutes. Their website has so many amazing goodies that can enhance any baking project or give you a short cut to any gourmet treat (they have great scone, coffeecake, and many other mixes, that you can whip up in a flash). My Cuz took me to the King Arthur Flour store in VT and my head was spinning from all the goodies, I could not focus! I have mentioned before what a difference their flour makes in my recipes. I get their newsetter and catalog, no I don’t have a problem, and there are always great recipes in it. This time around there was a recipe for Golden Vanilla Pound Cake and it caught my eye. I made it and the simple glaze and it was amazing. It is so simple but so moist and flavorful that it will knock your socks off. Oh by the way they sell the mix for this same pound cake if you are not a fan of baking. If you need a cake for a gift or just for yourself check this one out and you will hear the golden angels sing! 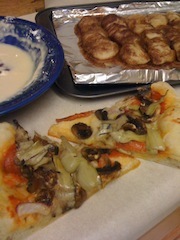 You are currently browsing the What Tara's Cookin' blog archives for April, 2011.